Trying to stay focused, motivated and productive for 8-plus hours a day can be stressful for employees. This stress can lead to a range of health issues. With our corporate wellness programs, you can now protect the well-being of your teams and give them the support needed to consistently and efficiently produce with fewer health-related distractions. Research reports and news articles consistently tout the benefits of weekly office yoga programs. These benefits include energizing employees, improving immunity, boosting levels of concentration and memory and so much more. As a result of these employee benefits, employers can see higher levels of performance, better retention rates and lower health care costs in regular wellness program participants. Best of all, these classes add a little extra fun to the workplace! 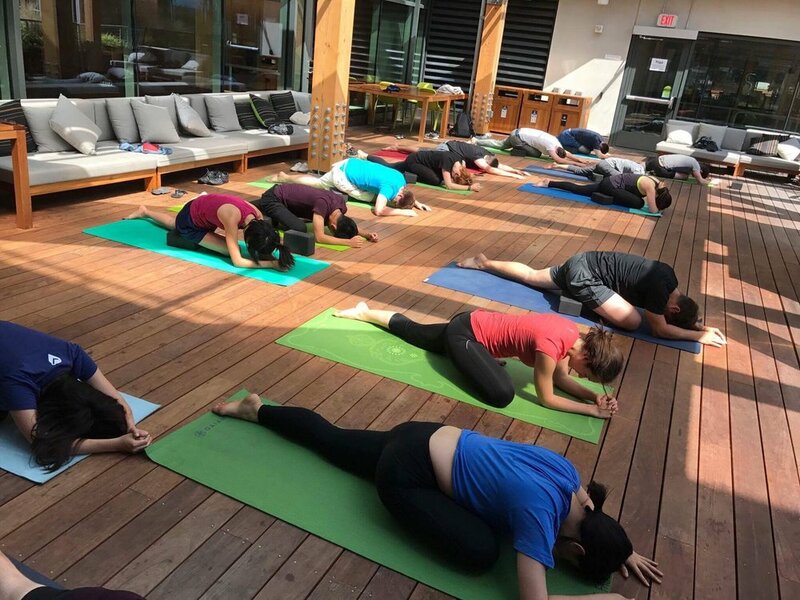 Although we're known for our top-of-the-line office yoga, NW Corporate Yoga℠ wellness activities go well beyond yoga instruction. We also support employers with wellness workshops, special events, team building activities and equipment procurement. We specialize in finding the ideal program for your company. During each initial assessment, a corporate wellness expert will ask a series of specific questions we've developed through SHRM, McKinsey & Co. and PwC studies to determine the right blend of wellness activities that will fit your culture and budget. At NW Corporate Yoga℠, we do more than just show up to instruct. From the very beginning, we work with office wellness coordinators to design customized classes, procure proper equipment and create wellness programs that include workshops, employee engagement ideas, professionally-prepared reports and much more. We're committed to our partners in helping them achieve success in their overall wellness program. Click here to register for a free basic class demo! NW Corporate Yoga℠ understands that each company operates differently, which is why we work with office wellness coordinators to identify the best locations and times to maximize the impact of NW Corporate Yoga℠ wellness programs in their offices. Our structure allows our NW Corporate Yoga℠ trained instructors to arrive whenever and wherever they're needed at your office. Click here to register for a free basic class demo! A diverse work environment requires diversity in its health and wellness programs. At NW Corporate Yoga℠, we can strategically tailor classes to your organization while also ensuring the exercises, movements and stretches are accessible for individuals with different abilities, limitations and preferences. Our ability to increase accessibility makes the environment welcoming, which encourages more employees to participate in the fun. Click here to register for a free basic demo! Through our carefully designed initial assessment review, we’ll gather information from you about your wellness goals, primary personnel concerns, time frames, budget requirements, facility options and more. Our team will take your input and design a wellness program that is customized to your culture and preferences, reflects industry best practices and places the company on a roadmap for achieving its wellness goals. When it comes to launching your program, NW Corporate Yoga℠ can handle the heavy lifting for you, providing an assortment of tools and support necessary to launch and maintain a successful wellness program. Unlike many wellness program service providers, we have created a suite of tools that measure the program’s results and regularly evaluates the program's ROI. This way, your company can see verifiable information on the return on your wellness investment. Please use the form below or call 425.908.0283 or email us at info@nwcorporateyoga.com to get started. NW Corporate Yoga℠ in the Office!